The story of one Honolulu cyclist's determination to visit all of the 50 United States and ride 50 km in each. I checked in to the Dallas Hilton Lincoln Center about noon today but my room was not ready and I was working against time to get Texas ridden. So...I did my Superman thing and dashed into the lobby men's room, changed into my riding duds, presented my luggage to the desk clerk for safe keeping, and beat feet for Lake View Park which was a not far away. 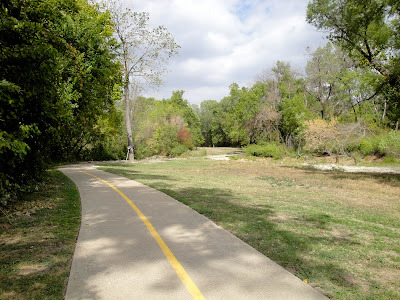 It's the starting point for the White Rock Creek Trail, which connects to the White Rock Lake Trail plus a new trail extension through several neighborhoods. White Rock Lake is delightful, with lots of activity areas easily accessible. Some of the loveliest homes in Dallas are located at White Rock Lake. 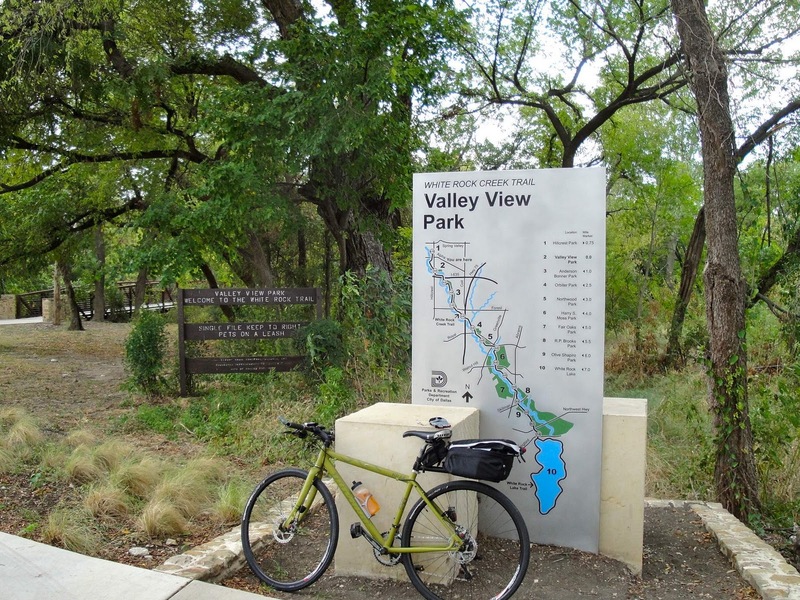 There were a couple of exciting detours due to heavy road construction in the area, but overall it was a great ride on a fine route. It was my first full 50k in 3 months so I was cruising for comfort. My room was ready when I got back to the hotel. And my Oklahoma cousin and his wife had checked in to the adjoining room. It's the Texas-Oklahoma college football weekend here, and our hotel is ground zero for the Sooner fans. It's an amazing event. We're going to the game tomorrow, I'll share the story next. Glad to have you back in the blogosphere Am enjoying your comments and adventures from afar. Keep them coming. Enjoy the rides. Cumulative 50-state Data: 2,782km/1,729mi/90 days including travel. South Carolina - see "Georgolina"
Please Share the Road. Mahalo, BikerBuck. "50k All the Way" ™TheLairdCo.LLC. Simple theme. Theme images by rocksunderwater. Powered by Blogger.